We can create board games in Visual Basic. Creating board games require some basic knowledge of maths as we need to perform some calculations. For example, we need to use the knowledge of matrix to create a board for the snakes and ladders game. Besides that, we also need to write decision-making code to deal with board games, as shown in the reversi game, where we use the If…Then..Else statements to check how many white and black pieces appear on the reversi board and which positions they occupy. In the case of Tic Tac Toe , we need to use the Boolean logic to check the adjacent slots are empty or not. In the game of Star War, we use the principle of the projectile in physics to chart the paths of motion. 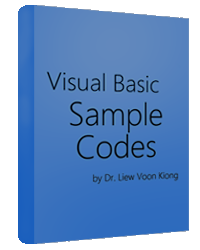 This year Microsoft introduced the latest version of Visual Basic, Visual Basic 2017. It is included in the latest Visual Studio package, Visual Studio Community 2017. 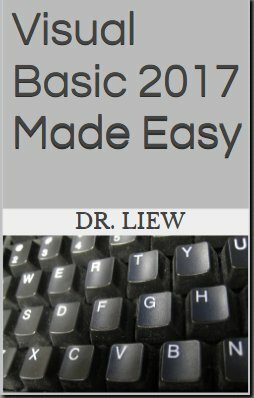 You can create all kinds of financial calculators in Visual Basic easily as long as long you know the relevant formulas. A program to test whether a number is a prime number. A program to plot a projectile curve. A program to simulate simple harmonic motion.